At the end of August 2013 six Kovsies will depart for Stanford Sophomore College in San Francisco, USA, to take part in a prestigious residential programme. The programme stems from a key partnership between the UFS and Stanford University. This programme involves the most talented second-year undergraduate students from both the UFS and Oxford universities joining the Stanford Sophomore College.These students spend over two weeks during the USA summer recess engaged in a programme which concentrates on the academic studying of innovative and multidisciplinary topics. The Kovsies students selected for the 2013 programme are: Patricia Mapipi and Sinazo Mabunu from the Faculty of the Humanities; Claudio Carlos and Elzahn van der Westhuizen from the Faculty of Economic and Management Sciences; and Stefan van der Westhuizen and Zakariyya Patel from the Faculty of Health Sciences. Image: Ready for Stanford. 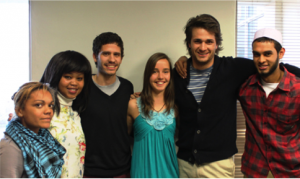 From the left are: Patricia Mapipi, SinazoMabunu, Claudio Carlos, Elzahn van der Westhuizen, Stefan van der Westhuizen and Zakariyya Patel.